Clean Cut Creations Vintage Auto Works Clean Cut Creations Vintage Auto Works is one of the nation's premier sources for all your automotive restoration needs. We're definitely not your average “custom” shop that just sells wheels and bolt on accessories. Sure, we can offer that too, but our shop can custom build a complete vehicle to your specifications. Classic car and truck restoration, custom body modifications, custom paint, metal fabrication and rust repair, air ride component sales, install and maintenance, vehicle accessories and detailing are just some of the services that Clean Cut Creations can offer. No project is too big or too small for us to handle. Take a look around ...There's a lot to see. Clean Cut Creations Vintage Auto Works is one of the nation's premier sources for all your Vintage automotive restoration needs. We're definitely not your average “custom” shop that just sells wheels and bolt on accessories. Sure, we can offer that too, but our shop can custom build a complete vehicle to your specifications. Classic car and truck restoration, custom body modifications, custom paint, metal fabrication and rust repair, air ride component sales, install and maintenance, vehicle accessories and detailing are just some of the services that Clean Cut Creations can offer. No project is too big or too small for us to handle. Take a look around ...There's a lot to see. Clean Cut Creations Vintage Auto Works is one of the nation's premier sources for all your Vintage automotive restoration needs. We're definitely not your average “custom” shop that just sells wheels and bolt on accessories. Sure, we can offer that too, but our shop can custom build a complete vehicle to your specifications. Vintage and classic auto restoration is our specialty. Our main focus is pre-1972 vehicles. If you browse through our Rides Gallery, you'll find cars form just about every era and style. Whether you are in to Customs, Hot Rods, Muscle Cars or stock restorations, there's something for everyone. We've worked on everything form '29 A Ford Roadsters, Tri-Five Chevys, Camaros, Mustangs & we've even built a full size Hot Wheels Super Van. Our expert staff can tackle projects from full restorations to assisting the classic car owner with care and maintenance of their collections. We can diagnoses and repair light mechanical or wiring issues, make rust repairs & perform body work on an ageing restoration or an original car that needs a little sprucing up. We accept claims from and work with all of the specialty collector insurance companies should anything happen to your classic car or truck. Don't assume that any collision shop will be able to care for your car the way you would expect. We specialize in classic and vintage automobiles. 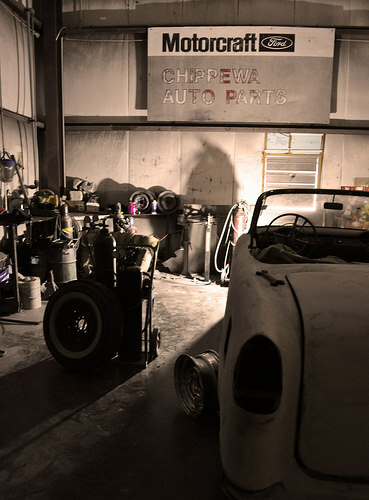 We know what it takes to care for and repair your classic vehicle. We mix all of our own paint colors in house, so color match is NEVER an issue. Although our primary focus is on classic and vintage automobiles we certainly can and do work on any and all of the late model specialty cars. We have customized quite a few of the 5th Gen Chevy Camaros, the new Mustangs and Challengers. We're no strangers to custom paint and body work. Take a look at our late model projects gallery to see more. No project is too big or too small for us to handle. Take a look around ...There's a lot to see. Enjoy! Here you will find build up galleries of all of the projects Clean Cut Creations is working on. Once a project is completed, we can’t wait to take final finished photos, usually with one of our striking models to showcase our work and the clients vehicle. 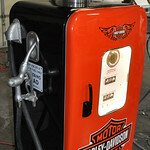 We also perform a lot of Vintage Collectible Restorations. Clean Cut Creations Vintage Auto Works St. Louis, Mo. Clean Cut Creations Vintage Auto Works is one of the nation's premier sources for all your Vintage automotive restoration needs. We're definitely not your average “custom” shop that just sells wheels and bolt on accessories. Sure, we can offer that too, but our shop can custom build a complete vehicle to your specifications. Classic car and truck restoration, custom body modifications, custom paint, metal fabrication and rust repair, air ride component sales, install and maintenance, vehicle accessories and detailing are just some of the services that Clean Cut Creations can offer. No project is too big or too small for us to handle. Take a look around ...There's a lot to see.